I almost didn’t write about this topic because there is already a ton of information out there. With so many warnings to be careful with this part of bird dog training and a lot of very good methods to choose from I wonder how in the world a person make their bird dog gunshy in this day and age? NEVER take your dog to the shooting range. EVER. And if you do, only take the dog who has been PROPERLY ACCLIMATED to the shotgun and has A LOT of REAL hunting experience. This would be the dog who hears a shot and immediately scans the horizon for the falling bird. NEVER take your dog out and just start shooting very close or, heaven forbid, right over him. 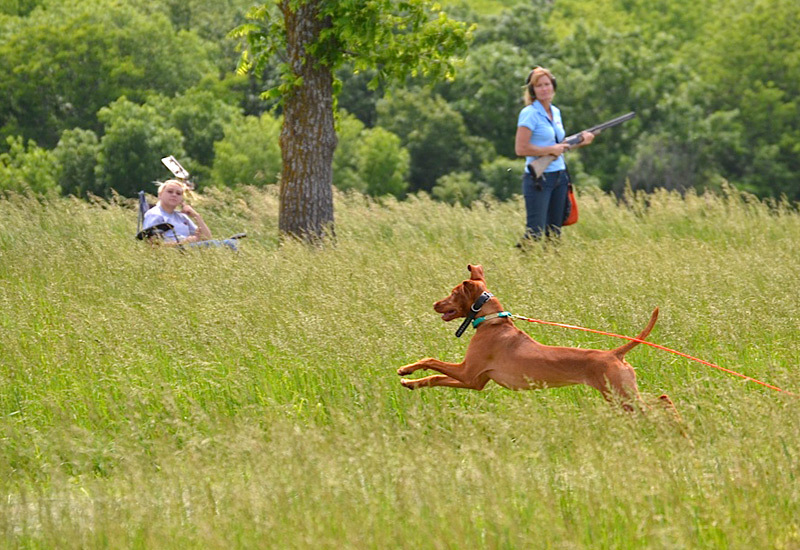 This includes that annual pheasant/quail hunting trip you need to go on and need to bring your dog along. Nope. Resist the temptation. Only bring your hunting buddy along once he has been PROPERLY ACCLIMATED to the shotgun…and then PROPERLY ACCLIMATED to SEVERAL shotguns in the field. Big difference having one gun shot over him versus 3 or 4. NEVER rush this part of your training. EVER. It’s much better (and less expensive) to be extra-cautious, to really take time for this training than having to fix the problems later. Trust me on this one. Been there. Done that. Thankfully, the dog we made gunshy had an insane level of bird desire and we were able to repair the damage we had caused. It took a year to fix just his sensitivity to the shotgun and when we thought we were back on track a series of other problems (related to his gunshyness) arose we then needed to fix. At the time of this writing my newest addition, Boulder’s N Fusion’s Smarti Pants of Southwind is just about to turn 8 months old. From the time I brought her home, I noticed she was much more aware of sounds and noise than the rest of our Vizslas. She didn’t show fear–run in the other direction when she heard something that was unfamiliar–but she would usually stop whatever she was doing to pay close attention. I couldn’t determine a pattern of specific type of sounds that would catch her interest. It seems she just has a heightened awareness of all sounds. I would shake out a trash bag to get it unfolded and there she’d suddenly be, bouncing 4 feet off the ground. Her tail wouldn’t be down, her body language didn’t seem stressed but just that she first noticed the sound and then came over to check it out put me on alert. Banging pans in the kitchen, the alarm clock going off, ambulances and police cars with their sirens going–she’d react. Again, not fearfully but just that she was reacting more than I was comfortable with made me take very careful note of how this could impact her introduction to the shotgun. I planned to follow the same process I learned from my field mentor Jon Hann of Perfection Kennels but I decided to first enlist his advice to make sure I approached this part of Smarti Pants’ training with even more awareness. Thankfully, the expert himself took the controls and made the decisions about when Smarti Pants was ready to have the sounds of the shotgun moved closer to her and when she was ready to have her first bird shot over her. Earlier this month, I participated in a 4 day clinic with several of my puppy homes. Top on my agenda for Smarti Pants was having her properly acclimated to the shotgun. I trust Jon. I know he won’t make a mistake with my bird dogs (and if he does, he knows how to fix it). He called the shots (pun intended) and within a few days Smarti Pants was reacting to the shotgun EXACTLY as I had hoped she would. At the shot she would spring almost straight up to see over the tall ground cover, looking for the falling bird. As soon as she’d catch a glimpse and her feet were back on the ground she’d tear out at top speed to get to the downed bird. She would hunt for the dead bird, pick it up and, most of the time, retrieve it. Every bird dog is different–with different strengths. Over the course of the 4 day clinic I also learned Smarti Pants is much more interested in hunting than she is retrieving. :-) But, that’s an aside–a post for another day perhaps. She did an acceptable job retrieving. I’m not worried about teaching her to love retrieving as well as hunting for birds. Been there, done that too! I’m thrilled Smarti Pants is properly socialized to the shotgun now and I can start planning the hunts I’ll take her on this upcoming season. This will be a season of learning for her! Though I already said it above, I’ll say it again because it seems this is where a lot of people just can’t help themselves. Chill out. Relax. Let your pup be a pup and quit getting so worked up about needing to shoot over him. Take your time with this very important piece of his training and pay close attention to his reactions. Have a plan, know what you’re doing before you start and if, along the way it seems the training isn’t going well, STOP. Seek out the help of a trusted trainer and work with him to get this piece in place correctly. When you’ve properly socialized your pup to the shotgun, this is the response you should see!